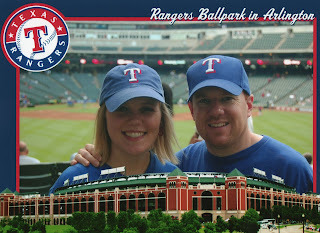 We received this picture in the mail today that was snapped at our last Rangers game. We just wanted to share - hope your Saturday is great! HELLO it's the weekend...meaning the end of another week -ready for a break! In the little hallway where our "guest quarters" are, we have a small wall of crosses. We enjoy receiving them and buying them. 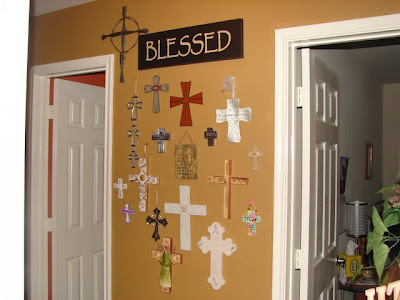 Each cross on our wall has a story or a special meaning - they aren't just casual purchases. The oldest one we have, I received as a gift for high school graduation - so it's about 12 years old. We love the beauty they bring to our home, but also what they symbolize - our Lord and Savior, Jesus Christ and the amazing sacrifice He made for us! This post is about a week behind, but the weekend before this last one...Riley's Dad came to visit us. 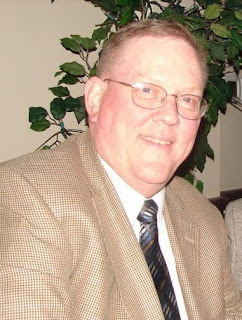 He arrived Friday afternoon and went home Sunday afternoon. We had a great time just the three of us (and Calvin too). Oh and in case you were curious, Kristin was on a trip with Aunt Karin. We ate too much (don't we always?? 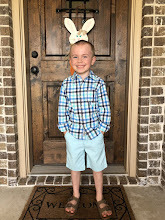 ), played games, watched the Rangers, visited about lots of things, gave him his birthday gift, toured the new Cowboys Stadium, enjoyed Starbucks, played guitar...just lots of fun! 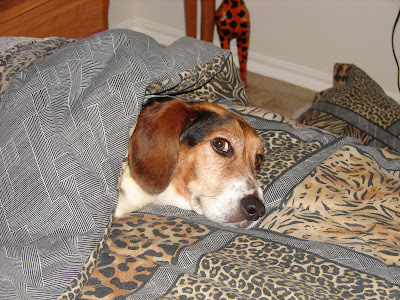 Well, we decided to give our blog a "facelift" and brighten it up some! We really like the new design and hope to add a few more touches to it. We hope you've had a great weekend...we sure have! We have been productive, but have had some fun as well - looking forward to a new week. Summer is coming to a close and school will begin very soon! I personally enjoy "Back to School" time because there is a new crop of fun supplies ready for the picking. I LOVE office/school supplies....cannot get enough!! Each year after all the kids are back in school and their supplies have been bought, stores will put the rest of the supplies on clearance and that's where I come in, haha! I've actually already bought a new package of markers for $1 - whoo hoo! Can you tell I'm easily pleased? Anywho, while I could go on and on about my love for all that is "supply" related, we are actually wanting to wish our nieces and nephews a great school year! We have 10 nieces and nephews (4 nieces and 6 nephews) and all but two of them are headed back to school...some today and some next Monday! 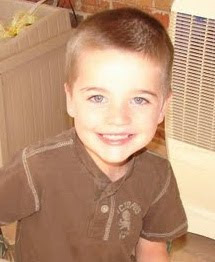 We wanted to wish our nephew, Brody a very HAPPY BIRTHDAY! We just wanted to wish Dad a very Happy Birthday! We had such a great weekend with him. There will be more pictures and details to come on our weekend together. Hope you have a great birthday and we love you lots! Well, today the NFL Pre-Season starts. It's not the most exciting of times, but each pre-season game just takes us one step closer to the regular season. Excited and thrilled doesn't even describe how we are feeling with football season fast approaching! It's actually exactly our 6 1/2 anniversary - so silly, we know. 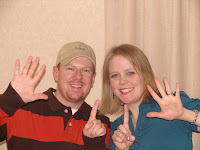 In February, we celebrated our 6th anniversary (in the picture) and six months from today we'll be celebrating our 7th. We are all about milestones and celebrating ALL of the special days in our marriage - there are many of them as we are sure you will see highlighted in blog posts to come. We even took a little weekend getaway trip on August 8, 2003 after we had been married 6 months - hee hee! We completely enjoy married life and thank God for all of the blessings he has given us in each other. Thanks for letting us share this mini-milestone. Well, it's that time again - time to share another part of our wedding with you. It's reception and honeymoon memories today! We had a VERY simple, but really nice reception. It was in the church Fellowship Hall and we had the traditional cake, punch, coffee, mints and nuts. We were able to enjoy those things and make the rounds visiting with all of the wedding guests. Our wedding cake and John's groom's cake were very delicious - enjoyed by all! 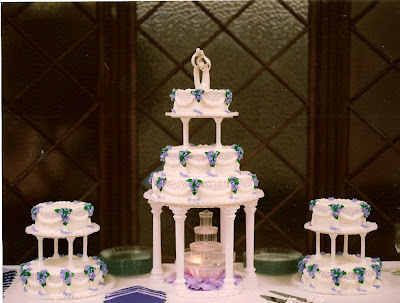 I loved our wedding cake...and John still remarks to this day about how yummy his cake was! Here is a picture of us cutting the cake! We also had the best man (John's brother, Jason) and the Maid of Honor (my best friend, Carianne) gave a toast. I would have posted a picture of that, but I had the "ugly cry face" and trust me, you don't want to see that! It was really beautiful though. Carianne gave me a copy of her toast and I have it in our wedding box! We had visitors last weekend - our family from Arkansas. It was John's Mom and Dad (Mark and Karen), John's brother Jason and his wife, Angela, and their boys, Jacob (10) and Isaac (8). 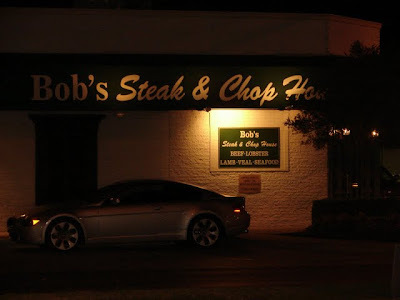 We had them (different people at different times over the weekend) from Thursday evening until Monday about lunch time. It was a full weekend, but fun-filled! Mark also got to spend some time with his sister Wanda, that lives in Dallas and another one of his sisters, Lillie, and her family in Burleson. We were able to spend time with everyone and even got to spend some alone time with our nephews - which was wonderful!